What a difference a year or several years can make. David Beckham's breakthrough in to Manchester United's first team came in the 1996-97 season. On the opening day of the Premier League season he scored his world famous halfway line goal against Wimbledon. He played a key role as Manchester United retained the Premier League. That season Beckham was voted PFA Young Player of the Year. He then picked up the number historic 7 shirt for the following season after Eric Cantona had retired. His England career began on the 1st September 1996 against Moldova. He was involved in the qualifying campaign for the France 1998 World Cup. However, because Glenn Hoddle thought he wasn’t concentrating on the tournament, he didn't start for the first two matches in France. The 3rd match against Colombia saw him start and scored his first goal for England. Unfortunately, he became the scapegoat for England's Quarter Final penalty defeat to Argentina. After England’s exit from the tournament he received horrendous abuse and threats. Furthermore, at many away grounds the next season he was subject to taunts from the home fans. However, he went on to play a key role in helping Manchester United win the treble the following domestic season (1998-99). People began to forget he 'had cost England the World Cup Trophy'. Certainly the United fans would have forgotten about it! 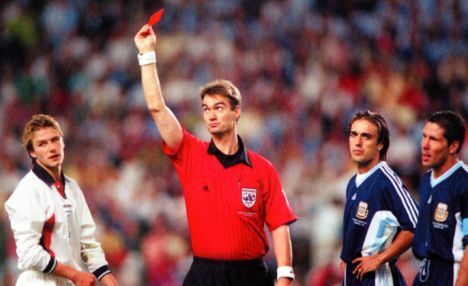 Regrettably, some England fans hadn't forgotten about the 1998 Quarter Final incident and he received abuse at the Euro 2000 match in which England lost to Portugal. He stuck up his middle finger to those fans insulting him. An action which then manager Kevin Keegan defended because of the horrible nature of the taunts. Many newspapers that had once encouraged the vilification of Beckham now called for an end to the abuse. In November 2000 he received a call from Peter Taylor appointing him captain for a friendly match against Italy. Beckham thrived in this role and despite a defeat; he impressed people with his leadership skills. He also managed to keep his head after Gennaro Gattuso tried to wind him up all game. This was a massive sign that he had matured since the 1998 World Cup. When Sven-Göran Eriksson was appointed England manager he decided to keep him as captain. A decision that Beckham repaid with vital goals and assists in the qualifying campaign for the 2002 World Cup in South Korea & Japan. THAT goal against Greece is famous all over the world. He was a national hero securing automatic qualification for the 2002 World Cup in such dramatic fashion. He was now lauded over and all thoughts of St. Etienne in 1998 seemed to have evaporated. 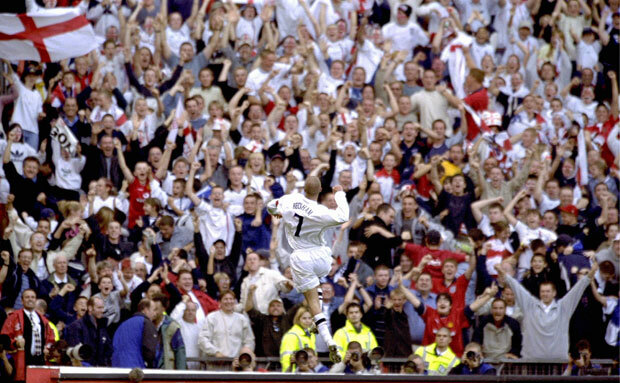 Leading up to the 2002 competition he was seen as an important player for England's chances of success in Japan and South Korea, just like any captain would be. There was devastation around the country after he was carried off injured with the infamous metatarsal injury that went on to haunt England players. I can never forgive Aldo Duscher for that tackle. He cost England the World Cup! Beckham wasn't 100% fit but we needed him and he was on the plane to the World Cup, just about making it in time. Though not near full fitness he stepped up. In the opening match for England, he set up Sol Campbell's goal against Sweden. The second game against Argentina was hyped up to be a great game. And boy it was. The Sapporo Dome stadium was an incredible venue for England's and Beckham's chance to rewrite the wrongs of tournaments passed. When Michael Owen was felled in the penalty area by Mauricio Pochettino England had a huge chance. Beckham put the ball down and was extremely focused on the task ahead. It was his opportunity to put the memories of 1998 firmly behind him and he delivered! England played some great football and, thanks to a wonderful David Seaman save, went on to win the game. Sadly, a Quarter Final defeat to Brazil put them out of the competition. Nonetheless after the game Beckham showed us once again why he was the man for the captaincy when he consoled the devastated players. People had seemed to forget that he was 'to blame' for the defeat in 1998. His successes with Manchester United and frequent contributions to goals for the national team had restored the belief from fans. The wonder-goal against Greece had cleared a lot of people's negativity towards him and his penalty against Argentina showed how far he'd come mentally. People loved him for his football and his leadership. He came through such adversity and torment changing his career for the best. Inspirational! He will always be my boyhood hero and favourite footballer. 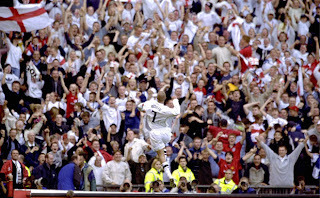 David Beckham was a top player with a wand of a right foot, a great professional and a brilliant advocate for the game.